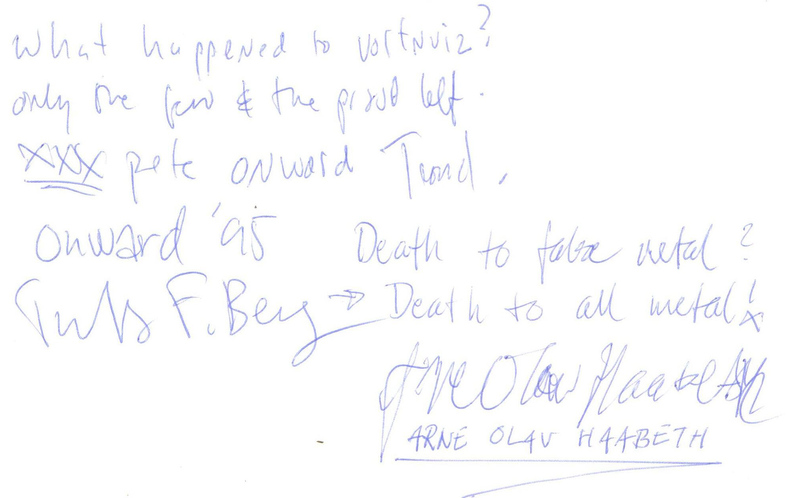 The Norwegian straight-edgers of ‘Onward’ had been here already during their tour with ‘Blindfold’ (92-08-09). Arne (Olav) Haabeth (bass), ‘Bhakta’ Ollie Andersen (drums), Peter Amdam (guitar; later did Words Carved Into My Head fanzine together with Arne) and Torgny Amdam (vocals; later in ‘Amulet’) were touring with ‘Mainstrike’ now. According to Peter Hoeren (Crucial Respnse recs) it was the first time they supported the In A Different Place album which he released in 1993. 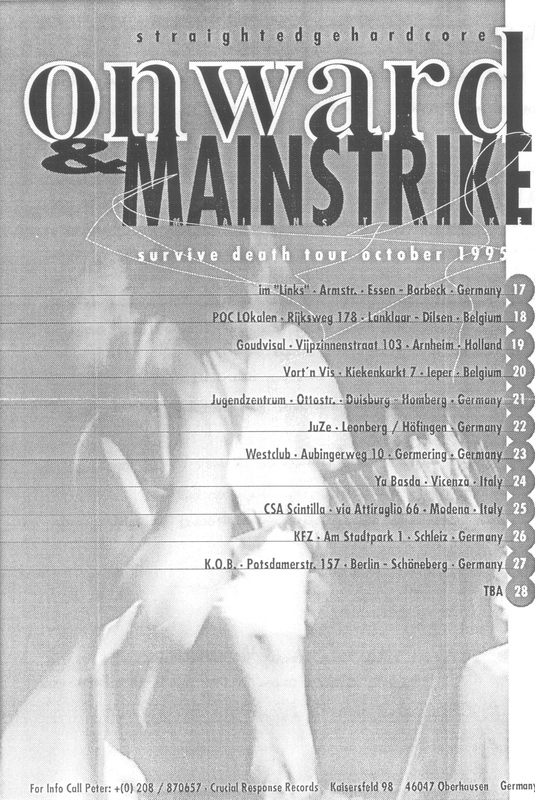 ‘Mainstrike’ had played their 1st show January 3rd of that year at the Goudvishal in Arnhem (the guys lived in the Arnhem/Nijmegen area) and in March they recorded their demo (Youth Crew 95), and they played the V.V. on 95-04-09 already. After this one here, they’ld also play at the Vort’n Vis festival (95-08-19). Their 7” Times Still Here was out on Peter Hoeren’s Crucial Response recs only a few days before they started touring with ‘Onward’ (recorded early September). In the band at this time were: Jeroen ‘Beertje’ Vrijhoef (guitar; he ran Left Wing recs and later – when he’d moved to Den Haag – Coalition recs, together with Marcel Palijama), Jasper Meijerink (bass; later replaced by Johnny van de Koolwijk), Jonas Moberg (guitar), Roland ‘Big’ ‘Lord Bigma’ Roller (vocals; also guitarist ‘Man Lifting Banner’) and Pepijn Oostenbrink (drums, later also in ‘One Day Closer’). I remember the tour really well. Great memories! it was the second time ‘Onward’ toured Europe. It was the first tour for the Mainstrike guys, their Times Stil Here 7” came out right before the tour. It sold like hot chocolate. The first pressing of 2000 copies sold in a short time. Onward would regroup with a new singer Trond and Truls on drums and record their best record These Words Still Pray later on. The tour was quite chaotic and wild… Lots of good shows and energy! 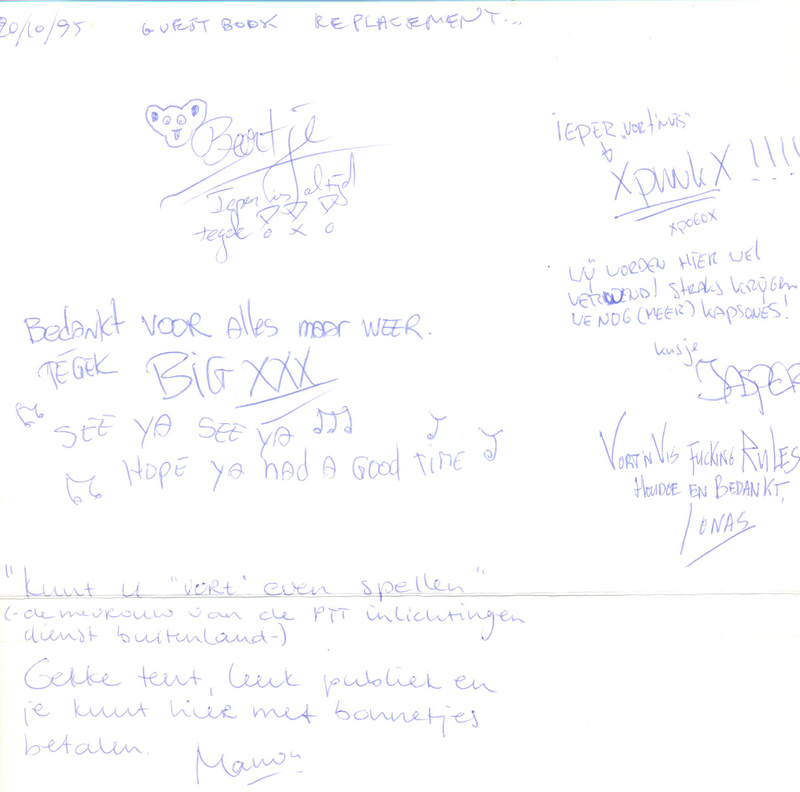 My then girlfiend and me went to Belgium for a break. A few days in Leuven with Jeroen [Lauwers?] and a night in Brussels. Somewhere along the way we went to this gig. Mainly to see Bruno [Genet recs] as we were doing that ‘B.H.S.’/’Kosjer D’ split. Had a great trip although we missed our bus back to the UK, hence 1 night in Brussels. It was unusually warm for Autumn. Always had fun in Belgium and enjoyed hanging with the Belgian ‘Kids’ (pun). Maybe we also went to Brugge to see that guy with the glasses and shaved head who lived with his parents. [Joeri Hoste] He was really great. All the Belgians were great. Even Edward… I probably wasn’t the biggest fan of most of the bands but it was always fun because of the people and the scene. It was a euro straight-edge affair. We met up with Bruno and spent the evening in the kitchen, missing all the bands.